Identify formulas and functions and know the difference between the two. Locate and use any of the functions in Excel using various methods, such as the Formula Tab. Use the 7 most important Excel functions in common spreadsheet computations. Understand the important difference between Absolute and Relative cell references to increase your computing power. Identify the various parts of an Excel formula so you can create or modify formulas to fit your needs. A basic knowledge of how to use Excel is needed. I recommend first taking my beginning course called Easy Excel Basics for Beginners – Learn Quickly and Easily. That will give you enough background to be ready to learn more about Formulas and Functions. 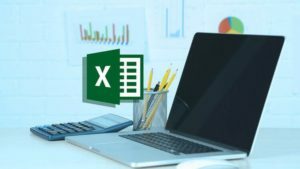 This course was created using Excel 2010, but all of the information is suitable for other versions of Excel as well, such as Excel 2013 or Excel 2016. Do you want to learn how to use Excel Formulas and Functions but find it all a bit overwhelming? Do you need Excel to succeed at work, but wonder where to even start? If so, you’re in the right place. In this course I’m going to teach you how to use Excel Formulas and Functions without any tears or pulling your hair out. I’m so confident that this course will increase your efficiency and understanding of Excel formulas and functions that I guarantee it! If you aren’t 100% satisfied with ANYTHING that you’ve learned or you don’t see the results in your work within 30 days of signing up, you get a FULL REFUND. I make learning Excel as simple as possible. Excel can seem extremely complex and overwhelming at times. But I break every function down into simple, manageable steps. I also use easy, realistic examples that you can follow along with. I get right to the point in every lecture. I know you’re busy so I don’t waste a lot of time on tangents, personal stories or filler like many instructors do. If the lecture is about VLOOKUP, I’m going to get straight to teaching you how to use VLOOKUP so you can put it to use right away. This course is designed for beginning or intermediate Excel learners who are new to using formulas and functions to make calculations in Excel. It is also appropriate for anyone who wants to learn to use functions but feels intimidated or overwhelmed. What is a formula? What is a function? The anatomy of a formula and how to create one. How to use the SUM function. How to use the AVERAGE and AVERAGEA functions. How to use the COUNT and COUNTA functions. How to use the IF function. How to use the SUMIF and SUMIFS functions. How to use the COUNT and COUNTIFS functions. How to use the popular VLOOKUP function. How to use RIGHT, LEFT and MID to sort data easily. A complete demonstration of how to use each function and what to use if for. Thanks for taking the time to check out my course. I can’t wait to help you take your Excel Formulas and Functions to the next level! To learn more now, watch one of the FREE preview lectures. Remember, If you aren’t 100% satisfied with ANYTHING that you’ve learned or you don’t see the results in your work within 30 days of signing up, get a FULL REFUND. If you’re ready to get started, click on the “Take This Course” button and in just a couple of hours you’ll be amazed at what you can do with Excel. This course is suitable for any level of Excel user from beginning to advanced but it is mostly geared toward beginning and intermediate level learners. This course is for you if you are looking for a clearer understanding of how to use common functions, where to find them and some tips and tricks to make your work with functions easier.